Tim Kaine Staunchly Supports Federal Funding of Political Science Research. Or Funding of the Arts. Whatever. I’ve always thought of myself as an artist. 20 Responses to Tim Kaine Staunchly Supports Federal Funding of Political Science Research. Or Funding of the Arts. Whatever. Well, did you get a B.A. (Bachelor of Arts) in Political Science as an undergrad? If so, then you’re definitely an artist. This is probably just bad constituent services… but it is also potentially symptomatic of a problem that I have discussed with colleagues: many people don’t understand that political science is a science and we don’t do a good job of conveying that to our undergraduate students, many of whom end up working on Capitol Hill and other such places. Undergraduate political science education needs to be less like high school civics and more like introduction to social science research. While I’d love to agree with you – I think ideally what you propose is correct – given that civics no longer seems to be offered in most high schools, it seems that without a basic grounding in how the U.S. government operates, an introduction to social science research would be completely lost on most undergraduates. The likely cause is an overworked staffer who didn’t bother to read the original letter very closely. Even worse, Tim Kaine’s son is a GW alum! “Thank you for contacting me to discuss the importance of investing in our nation’s education system. I appreciate hearing from you and value your input on this important issue. Like you, I support initiatives that will improve our schools and give our children the educational opportunities they need to succeed in our rapidly changing world. As a parent, and a product of Massachusetts public schools, I understand the important role that our public schools play in providing students with essential resources and educational tools available today. I share your belief that investing in education is critical to supporting the future development and growth of our next generation of leaders, our future workforce and our nation’s economy. During the 112th Congress, we will likely consider national education reform, and specifically the reauthorization of the Elementary and Secondary Education Act (ESEA). I will continue to support efforts and policies to increase transparency and create more accountability in our education system. It is critical that we hold our nation’s educators and schools to the highest standards so that every child has the opportunity to receive the best education possible. In working towards these goals, especially in this current economic climate, I also feel that we must take a hard look at how we fund public schools and what mechanisms are needed to control the rapidly escalating costs of higher education. Federal, state, and local governments must continue to work together to protect the quality of education being provided to students, while also developing additional cost-saving measures to respond to today’s tough fiscal environment. Yep, that’s a problem – when a Senator from the state with probably the largest educational infrastructure per capita can’t get it straight, we’re in trouble. Similarly, I raised this point with Ed Markey, who represents Cambridge in the House, in person – and I’m pretty sure he had no idea that the Coburn Amendment even existed. He’s also a Tufts alum. Sigh. “Thank you for expressing your support for the National Science Foundation (NSF) and its Political Science Program. I share your belief that the advancement of knowledge is at the core of America’s prosperity. Investment in research facilities and resources is central to maintaining and further developing that prosperity. NSF research is fundamentally important to our nation’s economy and security. The partnership between federal agencies and universities is critical to ensuring that the U.S. maintains its position as a global research leader. The Political Science Program awards research grants to political scientists helping to advance our understanding of citizenship, government, and politics. In April, the Senate Appropriations Subcommittee on Commerce, Justice, and Science and Related Programs — of which I am a member — approved FY2013 funding for NSF at $7.3 billion, an increase of $240 million from the FY2012 level. I received the same reply from Senator Kaine. I agree that it’s likely due to an overworked staff member’s slip-up, but I found myself irrationally bothered by it and sent short a follow-up letter so I could stop fuming and return to my dissertation. 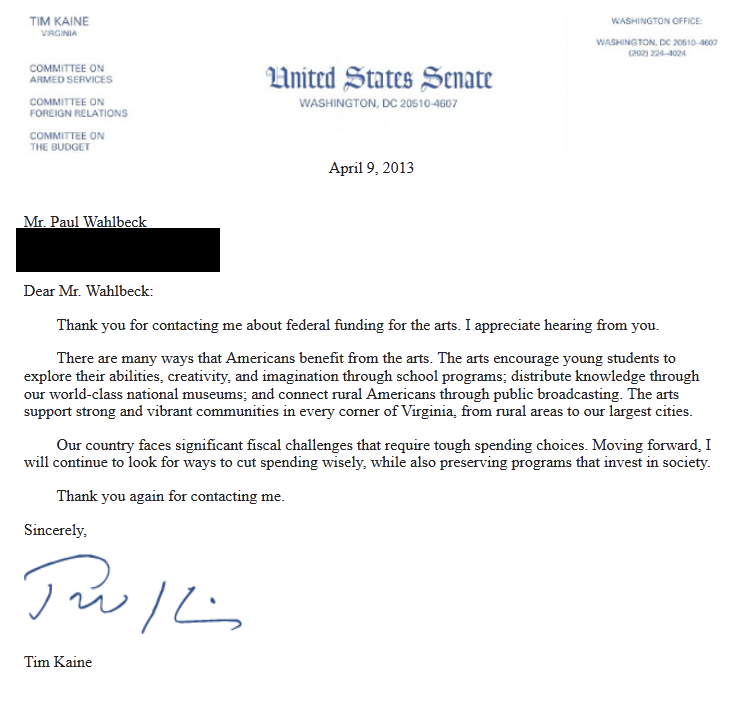 As someone who thinks of herself as a part-time musician, I’m happy to hear that Senator Kaine supports the arts. As a young political scientist I let the Senator(‘s staff member) know that instead of sending future campaign donations I’ll just give myself tiny grants since my work is no longer eligible for NSF funding. I’m sure the campaign will miss my $5. Congressional staff, specifically the LCs that handle the mail program, are overworked and underpaid. E-mails to Congress have skyrocketed in recent years, without any sort of expansion in staff or pay to tackle the constituent services. Something for political scientists to consider researching? 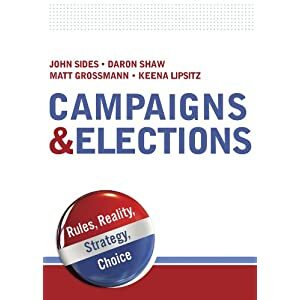 Since each of us is but one of millions of voters, unlikely to vote in Senate elections, and if we do vote it will almost certainly be for the incumbent in the primary and our preferred party in the general election, why should they care about another piece of mail? They have fantastic job security. Most people will be happy to get a reply from their senator and justify a vague response if the Senator represents their preferred party and consider it a typical pathetic response if the Senator represents the opposition, and simply keep voting as they always do. Todd, your logic is completely detached from reality. Do Senators care about each and every individual piece of mail? Yes, they do. Why don’t they? Elections can be very close, especially in a swing state like Virginia. Do they have the resources to adequately respond to constituent correspondences? Absolutely not. Congressional staff is down, pay is down, but correspondence is up over the last few decades. And DC is more expensive than ever to live in. It’s means, not desires, that limits Congress. Seems to me there’s a real opportunity for outsourcing here. I’m sure you could pretty easily set up a low cost, mostly automated service that would be more responsive than using Congressional staff who probably would rather be doing almost anything than responding to constituent mail. But at the very least, it seems that this is something that should be handled by district offices rather than offices in DC. The disturbing lesson is that political scientists do so little to understand real politics as it affects themselves. Rule 1. Do everything you can to sure that your friends know who you are, so that they can take the time to know what you need. Rule 3. Don’t write smart-aleck letters, no matter how irritated you are. Rule 4. When you know a storm is coming, get a rain coat. We knew the Coburn storm was coming. So why didn’t we prepare beforehand, by getting out publicly acceptable argument together and widely disseminated way beforehand. Rule 5. When you are defeated once, don’t put your tail between your legs and whimper. Calm down and think through what to do next. Another disturbing lesson is that getting a government that is very distant from them to respond to their needs is not something that ordinary people are naturally inclined to do. It takes a great deal of effort, which effectively excludes ordinary people from government and creates a situation where only organized, monied interests can get the government to respond. Todd Phillips may be basically right, at least as to the difficulty and the disinclination of ordinary people to make an effort. But the Coburn storm is coming again because the senator believes he is right. Should political scientists do nothing to get a better raincoat? We write to point out that although the kind of political science research in which you engage is very valuable, it does not qualify as artistic under our current guidelines and criteria. Accordingly, we would appreciate your refraining in the future from referring to yourself as an artist on your award-winning blog The Monkey Cage. Thank you. It’s so weird how this debacle is deemed funny–I actually don’t understand. We’re neither clear nor cognizant about what federal research funds mean to the life of a discipline; the role of federal grants in sustaining higher education quality in general, particularly at public universities; or the role of federal aid in making university a reality for the vast number of students who cannot afford school. This whole edifice is at stake, actually. Our approach is so blaze and arbitrary–we’re demonstrating Coburn’s (and supporters’) case. My colleagues in the STEM fields would not take such news lying down (nor leave themselves so unprepared); and many have mentioned to me they are moving into advocacy mode as they fully expect the SBE/PSC move to implicate basic (and maybe even applied) science research.